Can you please tell us a little more of French attitudes towards Robespierre? Can you please tell us a little more of French attitudes towards Robespierre? Is he generally regarded as a bloodthirsty tyrant or a great liberator these days or is the answer more nuanced than that? There are surprisingly few books about him in English and not that many websites either, given his significance as a political figure. Those resources that do exist seem to give a very incomplete picture of him and it is hard to understand the man and his motivations: in other words, was he an idealist who believed passionately and, ultimately, fanatically, in Liberty, Equality and Fraternity, or a cynical, power-hungry opportunist? Some websites give the impression that he was very protective of his younger siblings growing up and this formed his attitude to the extent that he thought of all of the French citizens as his family and he wanted to �protect� and father them all, whereas other sites give the impression he was an extremely cold and ruthless human being, softly spoken (as opposed to a ranting, table-thumper like Hitler) but extremely dangerous to have as an opponent. I think it is important to understand as he is the first in the long line of lawyers-turned-politicians that dominate our democratic parliaments today, so I would greatly appreciate in any insights or thoughts you have. Ok, I will upset a few more people (again…) but while some people have been waiting for their answers for months, Larry asked his just a few days ago and are already finding an answer. Make me interested and that might happen too. 😉 Don’t get me wrong, I don’t find the other questions in my backlog to be uninteresting (well, some are), it’s just that this “first come first serve” policy I have doesn’t work right now. For it to work I should be answering questions every other day or so, and we all know that this won’t happen. So it’s not impossible that the next questions I answer are also handpicked from the vast amount of questions I already got, but not�necessarily�in their order of arrival. I have to admit that while I find this question to be very interesting I will give a too short and possibly unsatisfying answer. The main reason is that it really requires an historian to give us the subtleties of his personality, somebody who has read his writings and more. Instead I will just give my personal opinion and try to expand to the general views of the man in France. 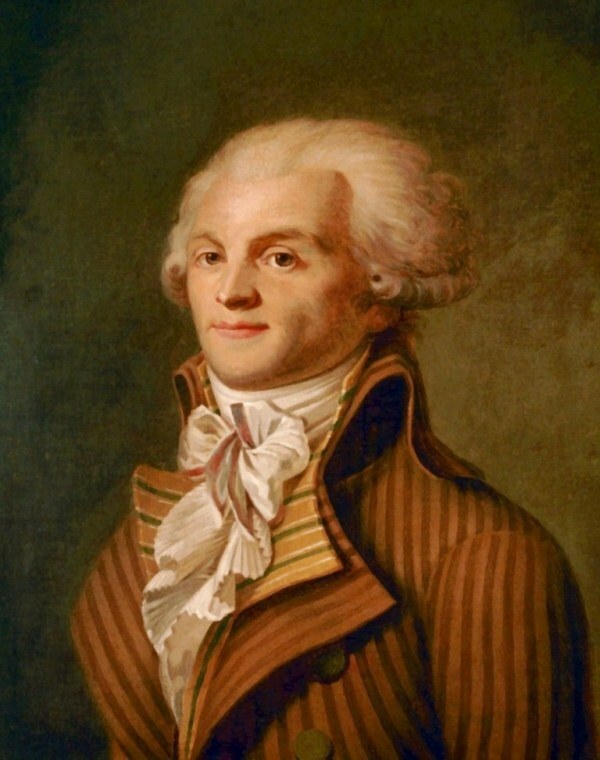 The thing we can all agree on concerning Maximilien Fran�ois Marie Isidore de Robespierre (yep, that’s his full name) is that he may be the most controversial figure in French history. The way I see him is that he was a guy who got carried away by his “mission” the way it can often happen during revolutions. In other words, I believe that he was a fanatic and not a cynic. Of course, because of that, he made many mistakes and he is the closest to a real full-fledged dictator that France had (not counting Ancien R�gime here for obvious reasons, ok, not counting Charles X and Napoleon III either), but on the other hand, I’m not sure France would have become the democracy than it is without him (or it would have taken a much different and much longer route to get there). I think that most French people who know enough about him have similar views on the guy, and even the Republic itself has a very ambivalent view on him. A telling detail, which may seem insignificant but that is very telling, is the fact that there are very few streets named after him in France (while every city and pretty much every town has its Rue Danton and Rue Mirabeau for example), and every time someone suggests that there should be one in Paris, it’s a huge and unsolvable debate. a bloodthirsty tyrant by some. a great liberator by some others. and both a bloodthirsty tyrant and a great liberator by some more. If anybody else has an educated opinion about the guy, please feel free to comment. Previous Post Could you recommend some French authors that have been translated into English? Next Post What do the French today think of the Huguenots back then, especially during the 16th Century War of Religions? Really? Napoleon doesn’t qualify for you? That’s strange. I also find it very interesting that there are many Rue Dantons but very few streets named after Robespierre. As you note, that is very telling. Thanks again. Looking forward to the comments and insights by other readers. By the way, I guess it is almost a separate question but, very quickly, what do the French think of monarchs like Louis “Sun King” XIV these days? Is he also regarded as a ruthless megalomaniac or do people think he heralded in a short-lived golden age? I have not seen any of them but the French seem to have made a lot of films about him in the last few decades, some examples being “Le Roi Danse”, “Saint-Cyr”, “Vatel”, “Louis:Enfant Roi”, etc. Yes, in some strange turn of history, Louis XIV is considered by many in France as the greatest king France had and other silliness like that. I think that it comes from the fact that during his reign France was more or less the undisputed most powerful country in the (Western) world, so people easily forget the constant warring and the nonsense that Versailles was, both putting France close to bankruptcy and causing the Revolution about a century later (and poor Louis XVI took all the blame when he was really not that bad). Yes, I read recently that Louis XIV built/expanded Versailles purely to have all of the other aristocrats close at hand to wait on him, thereby keeping them under close observation and so occupied with pointless rituals that they could not plot against him. Yes, to make a long story short, Louis XIV was crowned king as a kid, and then, there was some sort of revolt among aristocrats to seize power. He had a distrust of many people, especially the nobility because of that, and this is what triggered his idea to have all of his potential “overthrowers” close at hand, busy with vain and useless things instead of politics, which allowed it to control all of France (and put a definite end to feudalism – which was on its way out anyway).